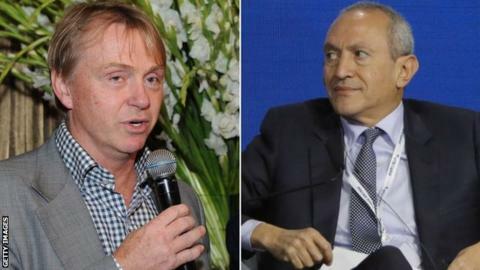 Billionaire businessmen Wes Edens and Nassef Sawiris will inject "significant investment" into Aston Villa, the Championship club has announced. Egyptian Sawiris is estimated to be worth $6.8bn (£5.2bn), while American financier Edens co-owns the Milwaukee Bucks NBA franchise. Villa owner Dr Tony Xia will become co-chairman and remain on the board. The extent of Villa's financial issues came to light after they missed out on promotion back to the Premier League. Villa, relegated to the Championship in 2016, lost to Fulham in May's play-off final at Wembley - missing out on a return to the top flight that would have been worth in excess of £160m. The club missed a £4m tax payment in June, with Xia understood to have cash flow problems because of strict rules about money leaving his native China. Villa reached an agreement with HM Revenue and Customs over the payment soon afterwards. With Villa also receiving a reduced parachute payment in 2018-19 and sizeable income required to comply with Financial Fair Play regulations, on-field cutbacks are expected. Former England captain John Terry was the first player to leave the club following their loss at Wembley, while midfielder Jack Grealish is expected to depart and they have also rejected a £5m bid from Stoke City for centre-back James Chester. There have been staff departures; chief executive Keith Wyness was suspended and then subsequently left Villa Park, and is suing the club for constructive dismissal, while director of football Steve Round left earlier this month. In June, former finance director Mark Ansell said Villa had "gone to the casino, rolled the dice and it hasn't worked" after the club's financial problems came to light. Villa spent vast sums on player recruitment following Dr Xia's takeover in the summer of 2016 and recorded a loss of £14.5m for the 2016-17 season, after losses of £80.7m during the campaign which saw the club's first relegation in 29 years. The new investors say they want to help fund Villa's return to the top flight. "As lifelong football fans, we are excited and privileged to have become part of this great club," Sawiris and Edens said in a joint statement. "Our goal is to bring sustainable success to the club, building on its rich history while respecting its loyal fan base and unique culture. "We understand that we are stewards of Aston Villa on behalf of the fans and we take that responsibility seriously. "We look forward to working with Dr Tony to undertake a thorough assessment and evaluation of the club in the coming weeks and our priority is to strengthen the squads and structures ahead of the upcoming season and beyond." Earlier this month, Dr Xia has said he would consider a "minority investment" in the club. "We have a common goal of delivering future success for Aston Villa and I look forward to working together to achieve this aim," said Dr Xia in a club statement, which confirmed the investment deal had been ratified by the English Football League. "To have come so close to achieving promotion last season was a humbling experience. "In finding such strong partners as Nassef and Wes we're gearing up to fight again and bring back the success that this club deserves and we all so want to provide it with. "The future is exciting on a number of fronts and I look forward to exploring further business collaborations." Forbes estimates Sawiris, 57, to have accrued a fortune of about $6.8bn (£5.2bn) as part of Egypt's wealthiest family - his father and brother are also billionaires. The London-based businessman runs OCI - one of the world's largest nitrogen fertilizer producers - and Orascom Construction. After a career in finance, Edens, 56, co-founded private equity firm Fortress Investment Group in 1998. He sold it in January for $3.3bn to a Japanese firm, reportedly making more than $500m in the process, and bought the Milwaukee Bucks NBA team for $550m in 2014 with fellow businessman Marc Lasry. There will be a few sighs of relief among Villa fans after Friday's news. Ever since the full-time whistle blew at Wembley and consigned Villa to another season in the Championship, there seems to have been a steady flow of bad news. The sudden departures of Wyness and Round, the doubts over player sales, paying tax bills and meeting Financial Fair Play regulations were all issues that were bogging the club down. While this news is not a "cure all" it does, at the very least, mean the club should be a whole lot more stable going forward. There are still questions over just how much the cash injection is and who will hold ultimate power now that Dr Xia is to be a co-chairman, but overall this will be seen as good news for all concerned with Aston Villa.